We have had several trips out since the last report, including some divers and several parties of sport fishermen and woman. 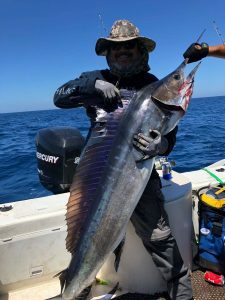 This report seems to focus on Marlin, Yellowtail, Tuna and grouper over Wahoo, which for this time of the year in Magdalena Bay is quite unusual. Having some world class divers 4 days out morning until evening on our boat is often a blessing. These guys dive 100+ feet and are like a super high tech fish finder. 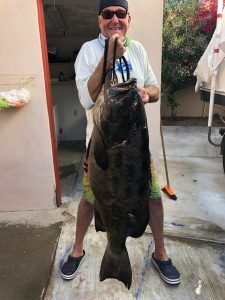 The Spear Fishing divers found many big grouper out at the thetis and they took 2 in the 50 lbs range but saw some in the 100-200 lbs range. They took several nice tuna, some yellowtail, a sailfish, and a marlin each. Not until th last day did they see a couple wahoo running around out there. One of the marlin they took on a pole spear, were convinced they had a world record and when we returned to the IGFA certified scale found it was 1 lbs 8oz short. Dangit! Now to fishing. All we can say is the striped marlin are everywhere. Literally everywhere. 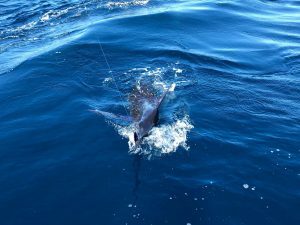 Lets put it this way this one Marlin Lure called Panamania had 12 strikes alone in one day with 3 marlin to the boat on this one single lure. Is that an amazing Lure? Sure it is, but all the others lures in the spread were hit as well. 2 Anglers (whos goal was marlin) out on the Capehorn on their last day of fishing brought 8 marlin to the boat, onboard and released for pictures. They had another 8 short bites and lost 3 others on the fight. All in all, they don’t recall more than a few minutes that day without rods bent. The previous day they landed only 3 marlin, but had nearly 20 strikes, jut an unlucky day and the marlin did not want to eat mackerel. Though this seems a bit unlucky, they still had 3 marlin on the day mixed in with some other species, but no wahoo. The yellowfin tuna are consistent, but nothing of great size as of yet. They are running sporadically with the marlin outside of the entrada, but there are huge schools out at the ridge. There are tons of yellowtail. Our mate landed 4 just dropping jigs waiting for the divers. Wahoo are around, just not in large consistent schools as of yet. 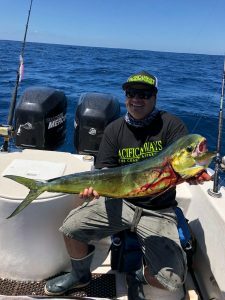 Dorado are the same, we seem to get a couple everyday, but haven’t found a large group of them as of yet. It is shaping up to what looks like could be a long and amazing season. I don’t recall ever seeing so many marlin so early in the year. This could be a sign of a long season, so lets wait and see. More reports to come on the specific trips from our crew.